This time of the year, it’s amazing what a difference a day can make. Thursday, snow on the ground. I couldn’t have taken these photos on Thursday because these plants were still buried under snow. 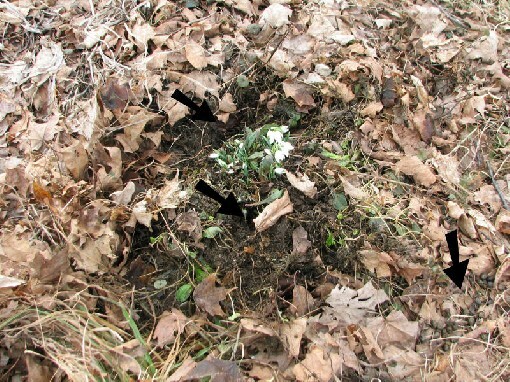 Friday, snow had melted, but nothing had bloomed. Yesterday (Saturday) the sun was shining and I had snowdrops blooming in three different locations. These first ones are ‘Sam Arnott,’ purchased from Odyssey Bulbs, who assured that they are the real thing. (Apparently there are impostors lurking in the trade.) But I remember them being much taller last year. This year, they give the appearance of being buried too deeply, as if (speaking anthropomorphically) they are buried up to their chests instead of their shins. I suspect our wacky winter may have something to do with this. The double snowdrops in the next photo have the same problem. Despite being located on the north side of the house, these ‘Sam Arnotts’ were the first to “drop” their blossoms. I found them that way on February 4th, when I was taking photos for my Hall of Shame post. And that’s how they remained, in a state of almost-but-not-quite blooming, until yesterday. Snowdrops can be maddening that way. 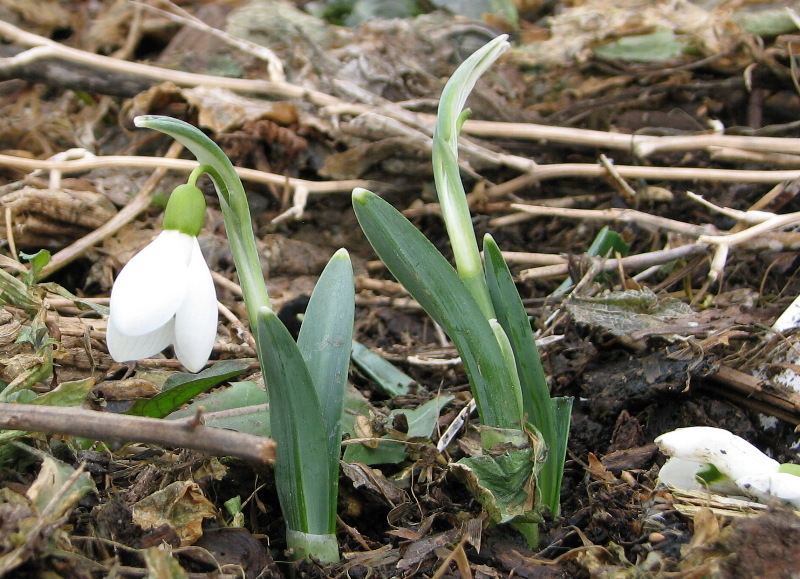 The more observant among you may notice that one poor snowdrop lost its blossom, which is laying off to the right. This last snowfall I was dismayed to see a footprint smack on top of the snowdrop location, and was not surprised to see the sad result. This is only the second year I have snowdrops on this side of the house, and the rest of the family isn’t used to being careful here so early in the season. These are my double snowdrops. They were the first to bloom last year. This year I was wondering if they were even going to show up. When I pulled on some ground ivy to try to neaten up this scene for the camera, much to my surprise the whole clump of snowdrops started rising with the weed. Further inspection revealed a hole in front of the clump, and a larger hole behind the clump (click on the image to enlarge it and see the arrows). Upon seeing the rabbit poop to the right (see third arrow) I concluded some wascally wabbit had made a burrow directly underneath the snowdrops. From the clumps of fur I found in the general vicinity, I believe it to be a deceased rabbit. We have seen a hawk and have heard owls, so there’s certainly no lack of predators. I mentioned snowdrops blooming in three locations. The third is my big patch in the Secret Garden. I included a photo from a previous year in this post, so I didn’t bother to take a photo of them yesterday. While there were a few blooming there, they weren’t as far along as they were in that previous photo. Are snowdrops the last flowers of winter or the first flowers of spring? To my mind, they are the poster children for mud season, that time of year when the topmost layer of soil has thawed but it is still frozen further down. Indeed, the same area that had been fully thawed less than a month ago was frozen at the depth of my index finger yesterday. No weeding got done yesterday, but I did some general clean up. Today it is still mild, but raining off and on. Just the thing to drive the frost out of the ground. The greening of the grass: that’s the sure sign of spring. Thanks for the snowdrop picture — as my kids were growing up it was one of our very favorite signs that spring was indeed coming! Around here burning bush is considered invasive, so I would do a little research before planting. Hydrangeas vary quite a bit in cold hardiness, and so do roses, so more research is required! 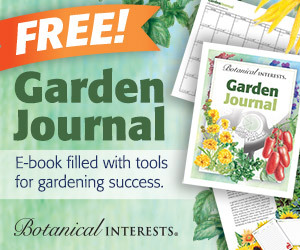 That’s my approach to gardening–I read, read, read, dream, plan, sketch, and do a little bit of actual new gardening each year. If you buy locally, it’s hard to get the timing wrong, as the plants are sold at nurseries when it’s time to plant them. Standard advice is to draw up a master plan, put in the expensive hardscaping and slow growing trees first, and gradually add beds and borders. I’m not sure how many people actually work this way. 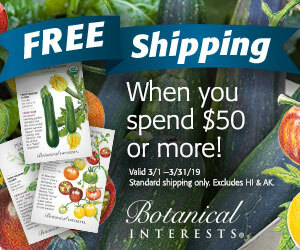 Gardeners are known for their impulse purchases. The way to begin is to begin: buy plants you like, stick them in the ground, and see how they do. Make mistakes and learn from them. I am writing from the (seemingly) swampy climate of eastern Iowa, where we got 2 inches of rain dumped on us last night in 1/2 an hour! I am a new homeowner who loves flowers, but seems to kill whatever I touch – I killed an aloe plant! Last fall I ripped out everything that the previous owners had been neglecting for 7 years and shaped it with some brick. So, for this spring, I have a completely bare planting bed to start with, but I’m anxious that I won’t get the timing right! I would love to plant some hydrangeas, burning bushes and rose bushes, and would really like to get a 3 season garden going, but I just feel a little overwhelmed at everything that’s out there! How does a newbie gardener with no sense of timing begin a 3 season garden? Well, it’s nice to hear that spring is showing up some places! Going to be awhile before we have any “greening of grass” up here in the UP of Michigan. We still have 2-3 feet of snow laying around with huge piles where it has been plowed up. And dirty with all the sand and gravel that is put down on the streets and roads. This won’t last long as another wintry blast is predicted for tonight into the next two days – could be anywhere from 12 to over 20″. My outdoor potting table is still covered, of course. I do have some tomatoes started in the house, and some left over bulbs in pots in the basement. It is a tradition u here to have a “St.Paddy’s Day storm” and I guess this is it. Well, it may make the mushers (sled dog drivers) in the family happy and the other son who plows snow in the winter. There is a plus side to many things! And we do need the moisture. So for now our gardening is limited to plans and a garden club meeting tomorrow night -is we don’t get snowed out!